Autumn 1944, Lapland War. A Bf 109 fighter of 9./JG 5, piloted by Rudolf Artner, shot the plane down. 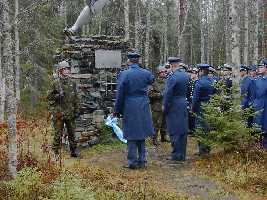 Pilot Captain Kalevi Heiskanen, machine gunner/signaller corporal Esko Kauppila and machine gunner corporal Leo Immonen were killed in action. 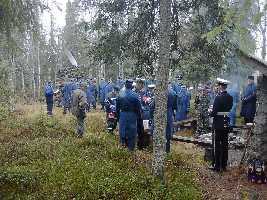 Navigator, 2ndLt Aarne Keko was injured. Keko wandered three days in wilderness with his wounds before reaching safety. 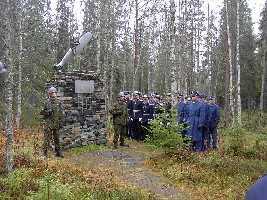 The Lapland Air Command anniversary memorial is held at the crash site. 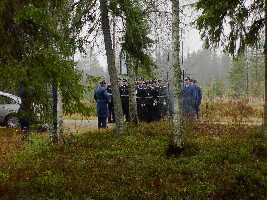 The occasion is unique in Finland, such an event is not arranged at any other memorial. 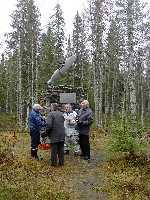 The Lapland Air Command Guild takes part in the occasion. The surviving officer took part in the anniversaries until the 49th, but didn't live to see the 50th. Olli Korhonen and Risto Korva of the Virtual Pilots Associaton give an on-site report from the anniversary. English translation: Lt(jg) Markku Herd, Finnish Navy. 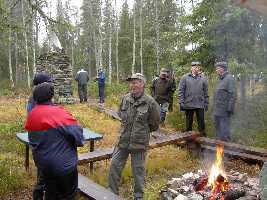 It began when I was at the weekly Wednesday meeting of the Oulu veterans, where Eikka (Eino Estama) read the Lapland Air Command Guild's letter to the subdivisions. 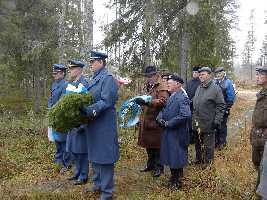 The anniversary and the wreath ceremony at the memorial was mentioned in the letter. 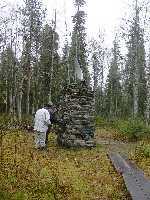 The Guild had influenced the selection of the memorial site as the place of the anniversary celebration. Some had disagreed on choosing a loss as the subject of the celebration, when a victory could be picked instead. 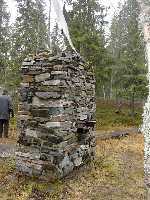 The decision was made in favour of the place especially because other sites were further away from Rovaniemi. Valte (Estama, Me 109 pilot) was the driver and he picked me up at about 8 AM. So we headed north. 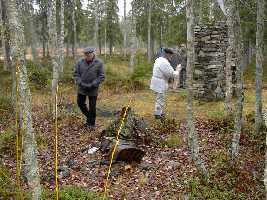 Among others, both of the Estamas were coming along (war pilots and members of the Pilven Veikot). 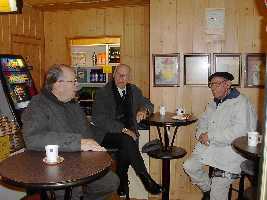 "Valte", (unknown) and "Eikka": the Estama brothers have a cup of coffee with a friend. Early arrival, an hour before set time, and greeting the locals. The fire is already started for cooking sausages, huntsmen are quick. The first coffee break after 9 AM, at a petrol station between Ii and Simo. Having set off early enough, we had plenty of time to spare. The station was built of logs. 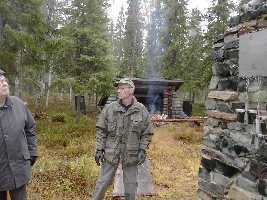 It featured a large shop section selling all kinds of Lapland souvenirs and equipment for wilderness travel. After a generous half hour break we went on. Soon the car turned to narrower roads. The final 30-40 kilometers were rough forest trails with plenty of confusing crossroads. 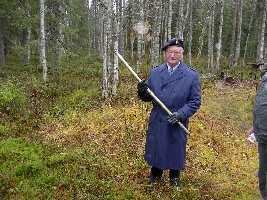 "Valte", a seasoned forester, knew the place and counted the location from ditches and streams. He kept telling fish stories, of how tiny trouts he had caught "back then" from puny streams that no one believed even had any fish in them. We reached the place half an hour before the time. 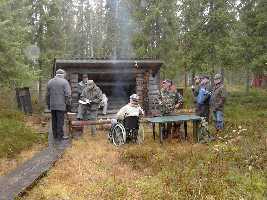 The veterans of the Simo region, diligent moose hunters, were already setting fires and assembling coffee tables. In the light drizzle we examined the memorial and the nearby crash site of the plane. Not much was left to see. There was some doubt if the propellor actually was from the crashed plane. Notice the piece of the exhaust system imbedded in the back of the base, in the shadow of the ashtray. Not much left of the plane. The memorial as seen from the fire, plane debris in the background. We went to greet the people at the fire and to wait for the rest to arrive. Eikka (Estama) showed the direction from where the plane had come, and estimated from the growth of the trees where the clearing had been. Little by little more people came. The "material division" of the community set the tables with thermos pots of coffee and baskets of buns. Collecting all names to the guest book. Representatives of the Lapland Air Command arrive precisely 15 minutes before the H-hour. 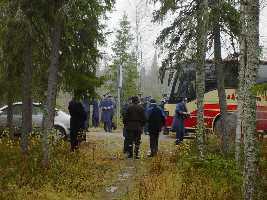 About 15 minutes before set time, a bus arrived from Rovaniemi carrying people from the Air Command. The honour guard assembled at the memorial, preparing for the ceremony. A guestbook was circulated, where everyone present wrote their name. Wreathes and flower bunches were prepared, and little by little the people moved by the trail to the memorial, grouping so that the "audience" were under the trees to the left, the wreath bearers on the trail, and the honour guard closest to the memorial to the right. The Commander of the 1st Squadron salutes the veterans (the C-in-C couldn't be present). The honour guard assembled at their places, wreathes are prepared. The Air Command, led by the leader of the 1st Squadron, set the first wreath. 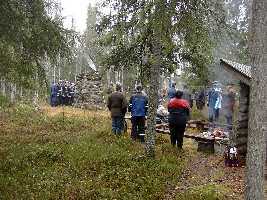 Next was the Chairman of the Guild, followed by the Oulu Subdivision with Eikka at the lead. A Hornet flight made their pass as scheduled, apparently at low level despite the low clouds - the cloud level hung at 50 meters, which unfortunately hid the planes from the eyes (but not the ears) of the audience. H-hour. The passing Hornets are heard but not seen. The commander prepares to set the wreath. After the formal salutes, it was time to free discourse with coffee and buns. Eikka made a joke to cadets with four stripes in their sleeves, calling them Staff Sergeants. They explained in a friendly way that they were fourth year Cadet Warrant Officers, not NCO's. 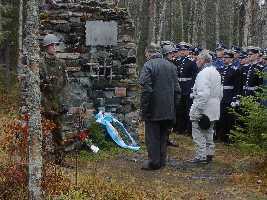 During the conversations it was mentioned that there are similar memorials elsewhere in Finland too, but nobody arranges similar occasions at them, especially with such a dignified group of people. The walking staff the rescued Lieutenant had used in his wilderness journey was brought to see, the Guild had kept it in store. A silver plaque was stapled on it to explain its significance. The rescued Lieutenant took part in these occasions to the end, but passed on little before the 50th anniversary of the crash. the 60th Anniversary is in two years, but many veterans doubted if they'll be in good enough condition to be present then. JK-256 was destroyed in a crash landing in the Simo region, east of the Kivalo ridges, at 16 o'clock after suffering damage by fighters. The pilot, the signaller and the machine gunner were killed. The badly burned and injured navigator survived the crash. 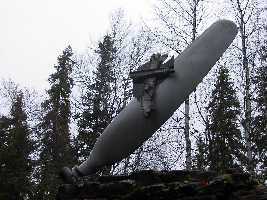 Six JK planes took off from the Rissala airfield at 1410 hours to bomb German troops and support transports. After the bombing Heiskanen spotted German ME 109 fighters about a kilometer ahead and banked quickly to the right. The Germans had seen the plane, however, and attacked immediately. Heiskanen took the plane to low altitude, but the defensive weapons malfunctioned. One fighter got close to fire and hit the right engine and wing. Heiskanen had to bring the plane to land. The plane glid over a clearing with sparse trees, then plunged sixty meters into the forest of thick tree trunks. The completely crippled plane caught fire. Only badly burned Keko managed to get out of the plane. His painful journey back took several days. Excerpt from the book "Kohtalokkaat lennot" (Fateful Flights). 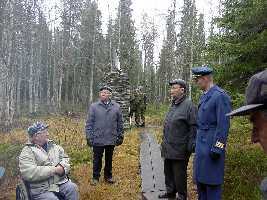 This page tells of the annual celebration of the Lapland Air Command, where Olli Korhonen and Risto Korva took part.